Yesterday I received a notification on my phone. From an app I’ve installed. The app “Smoke Free” isn’t responsible for me quitting. But it does reinforce that I made the right decision and I think it prevents me from sliding back into the habit. It charts how much time spent not smoking, money saved, physical changes, goals, cravings, triggers, etc. Quitting a decades old habit is not easy. Even if a person smoked one cigarette a day it’s still a habit. And kicking it can be difficult. I was just being a supportive friend to him. He didn’t ask me to quit. Times have certainly changed when it comes to smoking. Used to be everyone smoked. Everywhere! At the kitchen table. In the bedroom. Watching television. I remember men and women lighting up the second Mass was finished. The teacher’s lunch room in the parochial school I attended allowed smoking. When I got my first office with a door at the phone company I smoked while I worked. As did my friends who came and sat with me. At my high school lots of kids smoked on the property. Alongside the teachers who were also smoking. People smoked in cars, busses and trains. I remember smoking on a plane to Ireland in 1983. Looking back I can’t imagine how the non-smokers two seats down felt. That’s how different things were. When the tides of change swept in it was sort of funny. You’d go into a restaurant and they’d ask, “Smoking or non-smoking?” If you chose non-smoking you were seated directly across the aisle from the smoking section. It took years for the U.S. to create a non-smoking environment. But they did. Office workers are clustered so many feet from the entrance to their building. Airplanes have messages all over them. Campuses are smoke free. Even college campuses. Young kids are taught about the dangers of smoking at school. My friend Mary Ann once said that smoking in some places would be akin to blowing your nose on a curtain in a restaurant. It really is that frowned upon. I remember once having a cigarette after dining in a KL restaurant last year. You know the deal. Huddled up against the building hoping you don’t see anyone you know. Like I was smoking dope or something. In the distance I saw one of my daughter’s teachers. I panicked and dropped it. Like I was smoking dope or something. I guess that’s the thing. I didn’t really own it. Because of society and its stance on smoking. I was embarrassed by it. But that did not prevent me from doing it. I did not smoke in my car. Or in the house. But I still did it. Even though it was a legal activity for someone my age it was verboten at just about every place I frequented. Today I am smoke free. I do not consider myself a non-smoker yet. Maybe I feel that I need more time to earn that moniker. Not smoking is absolutely freeing. I did not have to rush outside in freezing cold Boston once I got off the plane. I did not have to go into the “smoking room” at the international airport. Which is the grossest place on earth. I felt that way even when I smoked. But I still entered. I do not have to leave the dinner table when finished and go grab a quick cigarette. You get the drift. It was inconvenient. So I guess my message in this posting today is this. If you smoke and want to quit I’m here to tell you it is doable. I’m doing it. It can be hard. We all know there are people who have/had scary health issues and they continue to smoke. It’s a terrible addiction. I know. I did it for nearly forty years. That’s a long time. I also know loads of folks who were heavy, heavy smokers and are now happily smoke free. It’s totally doable. And only positives will come out of the decision to quit. I promise. One month, thirteen days and one hour……..
A few weeks ago, my girlfriends treated me out to a nice luncheon, here in Kuala Lumpur, in honor of my forty eight years of causing trouble on this earth. The restaurant was very cool. There was a brown, wooden box on each table filled with white laminated cards. Designed as icebreakers and to get people off their cell phones and conversing with each other. The cards did prompt some sharing. But this card (photo above) stumped me and some of the others. Not just because the question ends in a preposition! It caused us to think about something we have done that could be deemed pride worthy. I struggled with that. For myself. Not others. That’s easy. We all have pride in our families, kids, and friends. So, the jury (me) is still out on my answer about myself. When I figure it out I will let you know. But, for now, there is a “who” not a “what” that I am very proud of at the moment. My younger brother has been out of work for nearly two years. Great guy, smart, hard working, honest and affable. Good looking, too, but that is just a fortunate toss of the genes. He’s an all around good person. He worked extremely hard to earn his MBA, at a nearby university, in the evenings. That was after working all day and also being a very hands on parent. Don’t know how he did it. But he did. And then he was laid off April, 2011. It’s been a challenge for him and his family knowing there is a mortgage, kids’ education, cars, bills, etc. weighing heavily on his shoulders. He applied for many jobs. Interviewed over and over for different positions. With no success. They always hired from within the company or pulled the job requisition. Or there were just too many people scrambling for one opening. Anyway, great news! He has landed a part time position for the Christmas season. As a driver/delivery guy for a well known U.S. package delivery company. We are all hoping it will turn into something permanent. Is he over qualified for this job? Absolutely. Is it the type of job he previously had? Absolutely not. But he knows a few things. He knows he needs to support his family. He knows he needs to do whatever it takes. He knows hard work. He knows honesty. He knows responsibility. I have seen many folks turn down a job (or not even apply) when they felt they were overqualified or that it was beneath them. They would rather have no job. Is it beneath anyone to provide for their family??? It’s not beneath my brother. He’s not too proud. 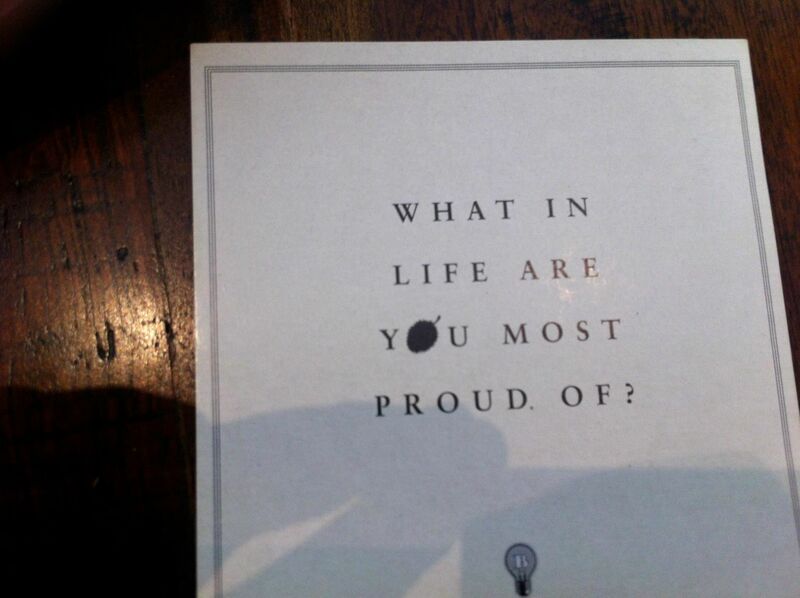 Ironically, his not being too proud is what is causing an overload of pride in me. I am too proud. I also want to note that my husband took a seasonal job with that same company twenty six years ago. We were newly married and didn’t have two dimes to rub together. So this somehow feels right. Also have to add that said brother told me I should write exactly what I want to write. He probably just didn’t think it would be about him. I know he will forgive me.